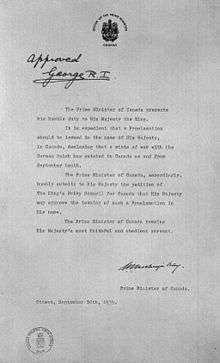 The military history of Canada during the Second World War begins with the German invasion of Poland on 1 September 1939. While Canadian forces were eventually active in nearly every theatre of war, most combat was centred in Italy, Northwestern Europe, and the North Atlantic. Over the course of the war, more than 1.1 million Canadians served in the Canadian Army, Royal Canadian Navy, Royal Canadian Air Force, and in forces across the Commonwealth. More than 44,000 lost their lives and 54,000 were wounded. The financial cost was $21.8 billion between 1939 and 1950. By the end of the war Canada had the world's fourth largest air force, and fifth largest navy The Canadian Merchant Navy completed over 25,000 voyages across the Atlantic, 130,000 Allied pilots were trained in Canada in the British Commonwealth Air Training Plan. On D-Day, 6 June 1944 the 3rd Canadian Infantry Division landed on "Juno" beach in Normandy, in conjunction with allied forces. 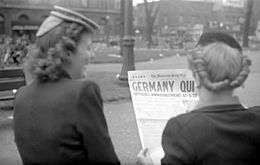 The Second World War had significant cultural, political and economic effects on Canada, including the conscription crisis in 1944 which affected unity between francophones and anglophones. The war effort strengthened the Canadian economy and furthered Canada's global position. Though Canada was the oldest Dominion in the British Commonwealth, it was, for the most part, reluctant to enter the war. Canada, with a population somewhere between 11 and 12 million, eventually raised very substantial armed forces. Around 10% of the entire population of Canada joined the army, a very small amount of which was conscripted. After the long struggle of the Great Depression of the 1930s, the challenges of the Second World War accelerated Canada's ongoing transformation into a modern urban and industrialized nation. Canada's wartime motor vehicle production constituted 20% of the combined total production of Canada, the US, and the UK. :167 The nation had become one of the world's leading automobile manufacturers in the 1920s, owing to the presence of branch-plants of American automakers in Ontario. In 1938, Canada's automotive industry ranked fourth in the world in the output of passenger car and trucks, even though a large part of its productive capacity remained idle because of the Depression. During the war, this industry was put to good use, building all manner of war material, and most particularly wheeled vehicles, of which Canada became the second largest (next to the United States) producer during the war. Canada's output of nearly 800,000 trucks, for instance, exceeded the combined total truck production of Germany, Italy, and Japan. Rivals Ford and General Motors of Canada pooled their engineering design teams to produce a standardized vehicle amenable to mass production, the Canadian Military Pattern (CMP) truck, which served throughout the British Commonwealth. Approximately half of the British Army's transport requirements were supplied from Canadian manufacturers. The British Official History argues that the production of soft-skinned trucks, including the CMP truck class, was Canada's most important contribution to Allied victory. Canada also produced its own medium tank, the Ram. Though it was unsuitable for combat employment, many were used for training, and the 1st Canadian Armoured Carrier Regiment used modified Rams as armoured personnel carriers in North-West Europe. In addition 1,390 Canadian-built Valentine tanks were shipped to the Soviet Union. Approximately 14,000 aircraft, including Lancaster and Mosquito bombers, were built in Canada. In addition, by the end of 1944, Canadian shipyards had launched naval ships, such as destroyers, frigates, corvettes, and some 345 merchant vessels. But perhaps no Canadian contribution to the Allied war effort was so vital as that made by the metals industries: half of Allied aluminium and ninety percent of Allied nickel was supplied by Canadian sources during the war. While the response to war was initially intended to be limited, resources were mobilized quickly. The Convoy HX-1 departed Halifax just six days after the nation declared war, escorted by HMCS St. Laurent and HMCS Saguenay. The 1st Canadian Infantry Division arrived in Britain on 1 January 1940. By 13 June 1940, the 1st Battalion of The Hastings and Prince Edward Regiment was deployed to France in an attempt to secure the southern flank of the British Expeditionary Force in Belgium. By the time the battalion arrived, the British and allies were cut off at Dunkirk, Paris had fallen, and after penetrating 200 km inland, the battalion returned to Brest and then to Britain. Pilots of No. 1 Squadron RCAF in Prestwick, Scotland, 30 October 1940. 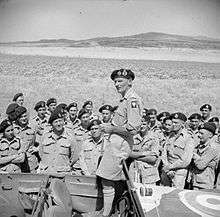 General Bernard Montgomery, commander of the British Eighth Army, addresses men of the 11th Canadian Tank Regiment near Lentini, Sicily, July 1943. Although it regularly consulted with Canada, Britain was essentially in charge of both countries' war plans during the first nine months of the war. Neither nation seriously planned for Canada's own defence; Canada's training, production, and equipment emphasized combat in Europe. Its primary role was to train pilots from throughout the Empire with the British Commonwealth Air Training Plan, which the British proposed on 26 September 1939, and supply food and raw materials, not send hundreds of thousands of troops overseas as it had done in World War I. Between the collapse of France in June 1940 and the German invasion of the USSR in June 1941, Canada supplied Britain with urgently needed food, weapons, and war materials by naval convoys and airlifts, as well as pilots and planes who fought in the Battle of Britain and the Blitz. During the Battle of Britain between 88 and 112 Canadian pilots served in the RAF, most had come to Britain on their own initiative. For political necessity an "all Canadian" squadron was formed under the British Commonwealth Air Training Plan at the start of the war and the Squadron served in the Battle of France. They were later joined by No. 1 Squadron RCAF in June 1940 during the Battle for Britain and they were in "the thick" of fighting in August, by the end of the battle in October 1940, 23 Canadian pilots had been killed. 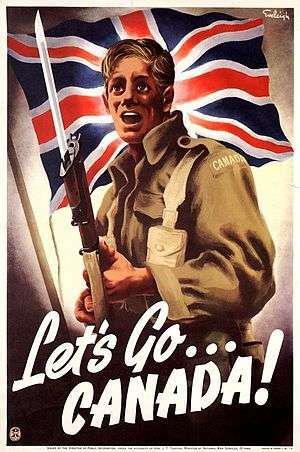 If the planned German invasion of Britain had taken place in 1941, units of the formation later known as I Canadian Corps were already deployed between the English Channel and London to meet them. As the fall of France grew imminent Britain looked to Canada to rapidly provide additional troops to strategic locations in North America, the Atlantic and Caribbean. Following the Canadian destroyer already on station from 1939, Canada provided troops from May 1940 to assist in the defence of the West Indies with several companies serving throughout the war in Bermuda, Jamaica, the Bahamas and British Guiana. 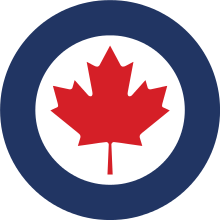 Canada was the primary location of the British Commonwealth Air Training Plan, the largest air force training program in history. 131,553 air force personnel, including 49,808 pilots, were trained at airbases in Canada from October 1940 to March 1945. More than half of the BCAT graduates were Canadians who went on to serve with the RCAF and Royal Air Force (RAF). One out of the six RAF Bomber Command groups flying in Europe was Canadian. 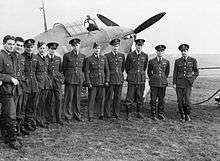 Squadrons of the RCAF and individual Canadian pilots flying with the British RAF fought with distinction in Spitfire and Hurricane fighters during the Battle of Britain. By 1 January 1943, there were enough RCAF bombers and crews in Britain to form No. 6 Group, one of eight bomber groups within RAF Bomber Command. Early in the war, Japanese troops invaded the Aleutian Islands. Canadian air force planes flew anti-submarine patrols against the Japanese while on land, Canadian troops were deployed side by side with American troops against the Japanese. Owing to circumstances, Canadians troops were only once sent into combat during the Aleutian campaign during the invasion of the island of Kiska. However, the Japanese had already withdrawn their forces at that point. Canadian Troops Arriving in Hong Kong. The Canadian government agencies also played a major role in the patterns of warfare in the Atlantic. The Canadian Navies Division operated a network of naval control of shipping agents in the neutral United States from 1939 to 1941. These agents managed the shipping movements of British shipping in the United States, and also managed the growing United States Navy systems in regards to basic trade movements. Special publications on trade matters were supplied to the United States Navy from Ottawa in 1941, and by the time of Pearl Harbor American port directors were working with Ottawa as a team. Ottawa’s job of studying trade movements and keeping track of intelligence was so effective and crucial that they were given the task of controlling shipping west of 40〫and north of the equator from December 1941 to July 1942, along with supplying the USN trade directorate with daily intelligence. 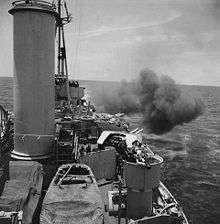 HMCS Uganda bombards Sukuma Airfield on Miyako Jima, 4 May 1945. Conditions aboard HMCS Uganda, compared to ships in the United States Navy, strict discipline, and the inability to display a separate Canadian identity, had contributed to poor morale and resentment amongst the crew. In an attempt to nip this in the bud and mindful of the change in Canadian government policy that henceforth only volunteers would serve overseas, the ship's commander, Captain Edmond Rollo Mainguy, invited crew members (before the official date) to register their unwillingness to serve overseas. Of the 907 crew members, 605 did so on 7 May 1945. Canadian forces in advancing from the Gustav Line to the Hitler Line, 1944. 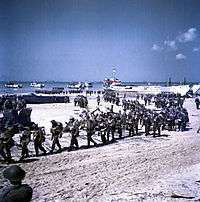 While Canadians served at sea, in the air, and in small numbers attached to Allied formations and independently, the invasion of Sicily was the first full scale combat engagement by full Canadian divisions since World War I. Canadian soldiers went ashore in 1943 in the Allied invasions of Sicily and mainland Italy, then fought through the long Italian Campaign. During the course of the Allied campaign in Italy, over 25,000 Canadian soldiers became casualties of war. The 1st Canadian Division and the 1st Canadian Armoured Brigade took part in the Allied invasion of Sicily in Operation Husky, 10 July 1943 and also Operation Baytown, part of the Allied invasion of Italy on 3 September 1943. 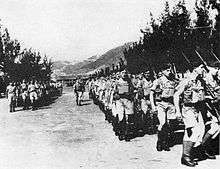 Canadian participation in the Sicily and Italy campaigns were made possible after the government decided to break up the First Canadian Army, sitting idle in Britain. Public pressure for Canadian troops to begin fighting forced a move before the awaited invasion of northwest Europe. Troops fought on through the long and difficult Italian campaign until redeployed to the Western Front in February–March 1945 during Operation Goldflake. By this time the Canadian contribution to the Italian theatre had grown to include I Canadian Corps headquarters, the 1st Division, 5th Canadian (Armoured) Division and an independent armoured brigade. Three Victoria Crosses were awarded to Canadian Army troops in Italy; Captain Paul Triquet of the Royal 22e Régiment, Private Smokey Smith of The Seaforth Highlanders of Canada, and Major John Mahoney of The Westminster Regiment (Motor). 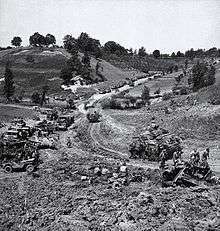 Notable battles in Italy included the Moro River Campaign, the Battle of Ortona and the battles to break the Hitler Line, later fighting on the Gothic Line. Canadians on Juno Beach, June 1944. On 6 June 1944, the 3rd Canadian Division landed on Juno Beach in the Battle of Normandy and sustained heavy casualties in their first hour of attack. By the end of D-Day, the Canadians had penetrated deeper into France than either the British or the American troops at their landing sites, overcoming stronger resistance than the other beachheads except Omaha Beach. In the first month of the Normandy campaign, Canadian, British and Polish troops were opposed by some of the strongest and best trained German troops in the theatre, including the 1st SS Panzer Division Leibstandarte SS Adolf Hitler, the 12th SS Panzer Division Hitlerjugend and the Panzer-Lehr-Division. 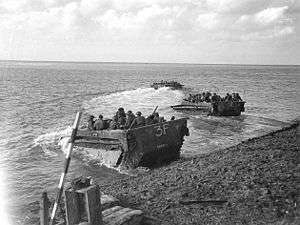 Buffalo amphibious vehicles taking troops of the First Canadian Army across the Scheldt in the Netherlands, September 1944. The arrival of Canadian troops came at a time of crisis for the Netherlands: the "hungry winter". Canadian troops gave their rations to children, and blankets to civilians. Bombers were used to drop food packets to hungry civilians in German-occupied Rotterdam, Amsterdam, and the Hague in "Operation Manna", with permission from Germany, so long as the bombers did not fly above 200 feet. ↑ The official name of this conflict varies from country to country. In Canada, official historians refer to the conflict as "the Second World War". ↑ J.L. Granatstein, Globe and Mail, "Going to War? Parliament will decide." ↑ Dziuban, Stanley W. (1959). "Chapter 1, Chautauqua to Ogdensburg". Military Relations Between the United States and Canada, 1939-1945. Washington DC: Center of Military History, United States Army. pp. 2–3. LCCN 59-60001. ↑ Dziuban, Stanley W. (1959). "Chapter 1, Chautauqua to Ogdensburg". Military Relations Between the United States and Canada, 1939-1945. Washington DC: Center of Military History, United States Army. p. 18. LCCN 59-60001. ↑ "Sqn Histories 121-125_P". Rafweb.org. Retrieved 2011-02-24. ↑ Veterans Affairs (21 Feb 2014). "The Burma Campaign". Retrieved 21 July 2014. 1 2 Chaplin-Thomas, Charmion (10 May 2006). "HMCS Uganda Votes". Maple Leaf. Retrieved 4 February 2010. ↑ Butler, Malcolm. "The Uganda". CFB Esquimalt Naval & Military Museum. Retrieved 3 January 2011. ↑ Foot, M.R.D. "The Dieppe raid. "History Today, August 1992. Retrieved: 29 November 2015.